Way back in March, we reported that Margot Robbie had come aboard to play controversial figure skater Tonya Harding in the upcoming biopic I, Tonya. But we haven't heard much else about the project since then. 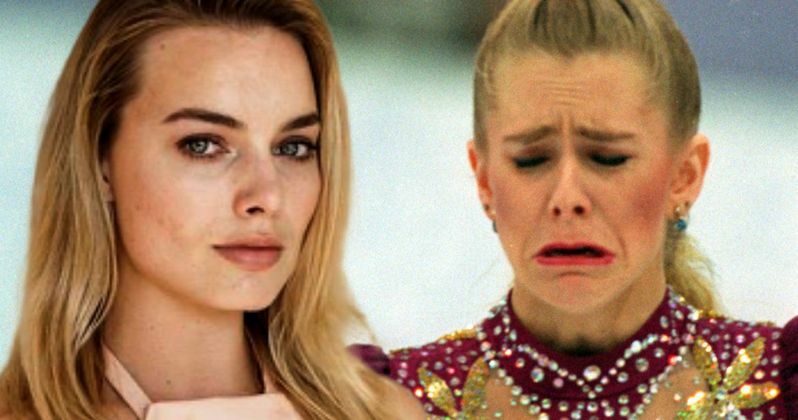 Today, we have word that production is already under way, with the first set photos surfacing, which show Margot Robbie's transformation into Tonya Harding, as she bears a striking resemblance to the skater. The actress was seen sporting a 1990s look, wearing a sweater and high-waisted retro jeans. TMZ debuted these photos, although it wasn't specified where exactly filming is taking place on this upcoming biopic. I, Tonya peels back the layers of Tonya Harding's sensationalized involvement in the 1994 attack on rival figure skater Nancy Kerrigan, exposing the absurd, tragic and hilarious story-behind-the-story of one of the most infamous scandals in the history of Olympic Games figure skating. Aside from Margot Robbie, the production has put together a talented supporting cast as well. Sebastian Stan has come aboard to play Jeff Gilooly, Tonya Harding's ex-husband, with Allison Janney portraying Tonya Harding's mother LaVonna Golden and Paul Walter Hauser playing Shawn Eckhardt, Tonya Harding's bodyguard. Jeff Gillooly and Shawn Eckhardt hired hitman Shane Stant to break Nancy Kerrigan's right leg, so she would not be able to compete at the 1994 Winter Olympics in Lillehammer, Norway. The attack did not go as planned, though, and Nancy Kerrigan only suffered a bruise, and recuperated in time for the Olympic games. Nancy Kerrigan won the silver medal at the Olympics, while Tonya Harding finished in eighth place. Last month Miramax acquired US distribution rights to I, Tonya, the incredible true life story of controversial figure skater Tonya Harding with Margot Robbie starring as Harding and Craig Gillespie directing. The edgy comedy will be produced by Bryan Unkeless for Clubhouse Pictures, Margot Robbie and Tom Ackerley for LuckyChap Entertainment and Steven Rogers, who also wrote the screenplay. Len Blavatnik and Aviv Giladi will executive produce for AI Film, which is financing the project. Rosanne Korenberg will oversee the project for Miramax. Miramax has yet to set a release date for I, Tonya at this time, but depending how long production is scheduled for, the studio could possibly get an Oscar-qualifying run in for I, Tonya by this December, but it's too early to tell at this point. It's also worth noting that the Winter Olympics will return in 2018, with PyeongChang, South Korea hosting the games. It's possible that this biopic could be time to coincide with the Olympic Games, but that release plan has not yet been confirmed. Take a look at the first set photos from I, Tonya below.